Christina Breda Antoniades reports, "My 9-year-old didn't hesitate when I asked her to help me try out Marble Math. She grabbed my smartphone and went right to work gleefully creating an avatar decked out in top hat and mustache. But she'd gotten no further than the first problem before she felt the need to protest. "What?" she groaned. "Fractions?!"" With a little nudging, however, I soon had her working her way through the "easy" level, rolling a marble through a maze to solve problems that involved addition, subtraction and, yes, fractions. 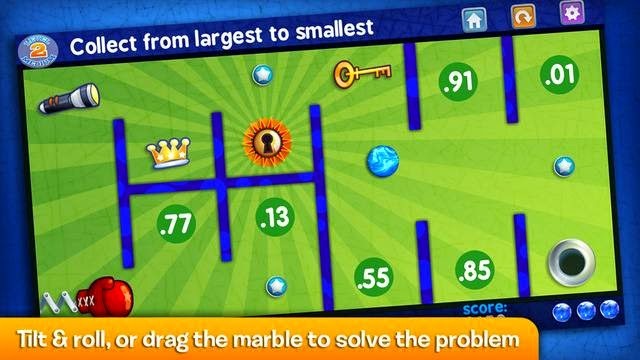 Launched in 2012, Marble Math is based on Common Core standards and aims to make math practice fun for kids age 9 and older. Get a problem right and you receive points toward a new marble to save or use, which, simple as it is, proved enticing enough to garner a satisfied "yesss" when my kids earned one. Hit an obstacle and you lose points. Get a problem wrong and you lose a marble, though you'll have a chance to retry it or see the solution. Parents can set up accounts for multiple players; each player can select the level of play and options such as marble patterns, sound effects, obstacles and bonuses. But the best feature is the ability to customize the problems for each player to tightly target certain skills.